You don’t have to be a poet, a children’s author or even John D. Rockefeller to be transported to reverie in Maine. For us in the West acclimated to the everlasting seasons, vast unoccupied places and an unquenchable search for renewal, the central coast of Maine is the yang of our yin. It matches the postcard sketch of craggy rock-bound inlets harboring workingman dories, scattered islands and lakes and studded mountains that thrust from the Atlantic. There is no better way to celebrate the centennial of the U.S. National Park Service than to spend a vacation in Acadia. Most of the park is contained on Mount Desert Island, a patchwork of parkland, private property and seaside villages. Nineteenth-century city-dwellers found relief from the cloying summers in the city. The well-heeled built extravagant houses, called cottages, and soon transformed the quiet farming and fishing villages. But an in- spired group of men who appreciated the natural beauty of the island thought beyond and worried that over time this island might be destroyed by development. How prescient they were. These conservation advocates, including George Dorr and Rockefeller, formed a public trust and acquired 5,000 acres in donated land to which they added to over time, eventually securing government protection by having it designed as a national monument. As more land donations expanded the area, the monument became the Lafayette National Park in 1919. The name was changed in 1926 to Acadia National Park. There were advantages to having formed the park from privately held parcels. In order to maintain the woodlands, mountaintops and fragile areas, no cars were permitted within the park. The 27-mile Park Loop Road circles the perimeter of the park, offering entry points along the way. Absent whiz-bang geysers, roaming bison and red rock mesas, Acadia shows off hardwood forests bumping up to the pristine lakes in the park’s interior contrasted with the granite cliffs that define the scenic coastline. Acadia is one of the nation’s most popular national parks. In 2015, more than 2.8 million people enjoyed the 49,000-acre resource. We visited for five days this August, the busiest month of the year there, and these are some of our observations and highlights. The Wild Gardens of Acadia present the most comprehensive sampling of the myriad ecosystems from forest to stream banks, marsh and bog. In just one acre, 400 species of trees, shrubs, flowers and native island plant life are represented. We noted plant lovers, certainly, but also kids who were fascinated particularly by the exotic pitcher plant, a strange carnivorous plant that lures foraging, flying or crawling insects to its cavity with nectar bribes. In our few days in the park, we had to choose from a 120-mile network of trails, each one offering a different experience. We rambled over the strenuous mountain cobbles to Great Head, which rewarded us with a spectacular overlook. Our favorite hike was the Tarn Pond, a meandering trail that parallels the shore. As we picked our way over large granite boulders, we were frequently stopped by a splash, a bubble or a glistening vortex. Pond life was alive. Eagle Lake is the second-largest body on the island, which supplies the water for the nearby town of Bar Harbor. On one of the famous coach roads, the walk takes you around the lake with views of sailboats and waterfowl. This is also a popular bicycle path. Acadia is worth a week or two, but Maine’s midcoast is dotted with towns perched at the side of an inlet or bay. 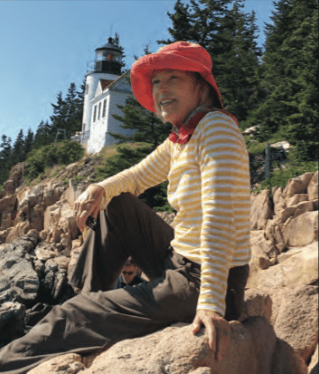 In Bar Harbor, we stayed in a hotel that overlooks the harbor and watched from our deck the sailboats and the seabirds that are well aware of the rich sea life. We began our trip in Portland. From there we made our way up the coast, stopping along the way. I wasn’t going to miss Freeport, the flagship home of L.L. Bean. We anchored the next four days in Rockland, a quintessential seaport village with a successive history in shipbuilding, lime production and fishing. Today Rockland is still a vibrant lobster-fishing hub, and home to the Maine Lobster Festival, an annual celebration of the town’s primary export: lobster. Rockland also is home to the Farnsworth Art Museum, a world-famous art gallery containing paintings by Andrew Wyeth and other well-known New England artists. Day excursions could include hiking and visiting the many lighthouses along the coast. Of the 48 lighthouse, 18 are within 40 miles of Rockland. A trip to Maine is a treat to us in the West. Just two hours driving from Boston to Portland, this is a vacation that is worth considering.